Has there ever existed a human being who did not wish for greatness? Has there ever been a young person who did not dream of living a mythic life, as depicted in his or her favorite stories? Don't even we adults still dream of breaking free of our societal boundaries, to live as the heroes and heroines who once inhabited our imaginations? In fact, I'd argue: This is likely why myths, as well as true stories of men and women who've lived 'mythic' lives, seem timeless, immediate, and forever relevant. No matter what age in which they are told. This is why stories of mythic heroism seem to have permeated the art of every culture known to Man since the dawn of recorded history. We have cave art 40,000 years old, depicting the daring actions of ancient hunters, armed with primordial weapons of stick and stone. We have the writings of Sumerian, Egyptian, Native American, Greek and other cultures, portraying mythic figures, gods and goddesses. More recently, we have comic books and films, portraying the heroes and legends that inhabit our collective psyche. And think of it this way: What good is a myth if NOT 'to live by?' To model, and to use as a motivating factor to better one's life? If not for these reasons, a myth is rendered meaningless, irrelevant; entertainment at best! So how can we use mythical tales to improve our lives? 1) Find a great story that speaks to you, personally. Years ago, I read Joe Hyams' Zen In The Martial Arts. In that booklet, Hyams tells the story of Mas Oyama. Oyama was a karate practitioner who, to improve his mind and body, lived for a year and a half alone in the desolate mountains of Japan. There, he bloodied his fists against trees. He meditated under icy waterfalls. He did thousands of calisthenics, daily. At the end of this sojourn, he emerged a disciplined, supremely fit 'machine' in the art of karate. I've read his story countless times over the past decade. And I can say without question: It has helped me become the athlete that I am today. Find a timeless story that speaks to you. Read it often. And you'll see how valuable a 'tall tale,' can be. 2) Meditate upon your chosen myth, each morning and night. Picture that mythic figure, defying the odds that seek to undermine it. Then imagine this myth 'becoming one' with you. You can even imagine yourself and this person merging into one, greater whole. Believe me: This is not as ridiculous as it may first appear. Man has now proven that there is little that separates us from every other thing on earth, living or 'dead.' In fact, the only reason a chair or table seems separate from you, is that the atoms which make it, vibrate at a different speed than your own. So is it absurd to imagine that some spiritual component of a mythic being, may dwell within you? 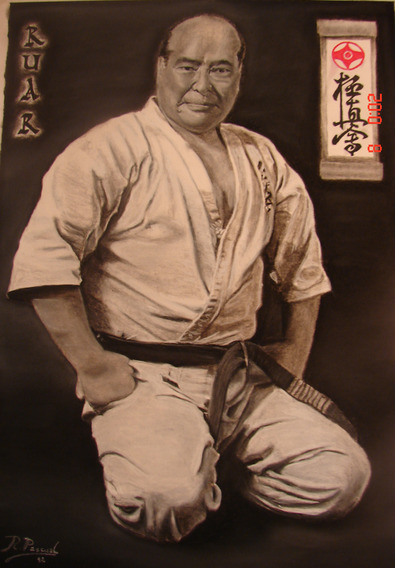 Each day, I pondered the myth of the great karate artist, Oyama. I imagined myself training my body and mind as he did. I pictured myself 'becoming one,' with the same spirit that made him. I did this in the morning at sunrise. I did the same before sleep each night. And I'll tell you this: By repetition, I ingrained the image of myself - merged with that of the karate master! - deep into my subconscious mind. Choose a myth that inspires you. Meditate on it daily, in this precise way. 3) Model your chosen myth in EVERY action you take. For me, this meant expanding my exercise regimen to include elements I'd not considered before. I changed from lifting weights to calisthenic workouts. I learned to enjoy silence, where before I'd been a big 'TV watcher.' I took up meditation. I fasted often. I changed my diet from one consisting of cooked, processed foods, to one that emphasized raw, natural fare. I practiced greatness as Oyama did, in every action. I adopted methods of training I'd considered irrelevant, even 'silly' before! I even began taking ice-cold showers to develop my mental discipline; modeling the master's habit of sitting beneath freezing waterfalls. Was it all worth it? Yes. For by this method of modeling, I became the disciplined athlete I'd always wanted to be. You're going to like your results. Summary: A myth can be a valuable tool. You can use it to go from weak to strong. You can go from lazy to disciplined. You can go from average to GREAT. In fact: You can mold yourself by myth - just as a sculptor hones a crude stone, into a thing of razor-sharp beauty.